This article is about the town Songkhla. For other uses, see Songkhla (disambiguation). "Singgora" redirects here. For the historical city, see Sultanate of Singgora. Songkhla (Thai: สงขลา, pronounced [sǒŋ.kʰlǎː]), also known as Singgora or Singora (Pattani Malay: ซิงกอรอ), is a city (thesaban nakhon) in Songkhla Province of southern Thailand, near the border with Malaysia. As of 2006 it had a population of 75,048. Songkhla lies 968 km (601 mi) south of Bangkok. 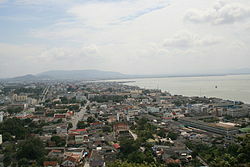 Despite being smaller than the neighboring city Hat Yai, Songkhla is the capital of Songkhla Province as well as the Mueang Songkhla District (Songkhla town district). At the opening of Songkhla Lake to the Gulf of Thailand, Songkhla is a fishing town and also an important harbour. It is the major seaport on the east side of the Isthmus of Kra. French hydrographic / topographic map of Songkhla, during the reign of King Narai the Great, 1687. Songkhla looking west from Khao Tangkuan, c. 1930. Songkhla's Nakhon Nok Rd., c. 1932. The ruins of the ancient port city of Satingpra are just few kilometres north of Songkhla. It was one of the most important trading centres of the Tambralinga Kingdom. Archaeological digs and investigations conducted toward the end of the 20th century testify the existence of a fortified citadel protected by a moat and a quadrangular surrounding wall made of brick. A sophisticated system of canals connected the sea to the Songkhla Lake permitting the circulations of ships. The excavations brought to light artifacts of great historical and artistic value. On 8 December 1941 local time, hours before the 7 December (Hawaii time) attack on Pearl Harbor, the Imperial Japanese army landed here, invading Thailand. It then moved south towards Perlis and Penang as part of the Malayan campaign which culminated in the capture of Singapore. Since 2003, Songhkla has been affected by separatist insurgencies in neighboring Narathiwat, Pattani, and Yala. The municipality's mayor, Peera Tantiserane, was murdered there in 2012. The majority of the population is Buddhist with a large proportion of Muslims, especially in the rural areas fringing the Malaysian border. These Muslims speak Yawi language, a Malay-related language which has some Thai influence especially loan words borrowed from the Thai language. Songkhla's district (amphoe) has five tambon administrative organizations (องค์การบริหารส่วนตำบล). Songkhla town takes up the whole of Bo Yang division. ^ "Distance: Bangkok to Songkhla". Google Maps. Retrieved 23 May 2015. ^ Stargardt, Janice (2001). "Behind the Shadows: Archaeological Data on Two-Way Sea Trade Between Quanzhou and Satingpra, South Thailand, 10th-14th century". In Schottenhammer, Angela (ed.). The Emporium of the World: Maritime Quanzhou, 1000-1400. Volume 49 of Sinica Leidensia. Brill. pp. 309–393. ISBN 90-04-11773-3. ^ Michel Jacq-Hergoualc'h (2002). BRILL (ed.). The Malay Peninsula: Crossroads of the Maritime Silk-Road (100 Bc-1300 Ad). Translated by Victoria Hobson. pp. 411–416. ISBN 90-04-11973-6. ^ Parfitt, Allen. "Bicycle Blitzkreig [sic] The Japanese Conquest of Malaya and Singapore 1941-1942". MilitaryHistoryOnline.com. Retrieved 9 Aug 2012. ^ Morch, Maximillian (2018-02-06). "The Slow Burning Insurgency in Thailand's Deep South". The Diplomat. Retrieved 3 July 2018. ^ "'Hitman' sought in Peera murder". Bangkok Post. 2012-11-13. Retrieved 2013-02-20. ^ "Climatological Data for the Period 1981–2010". Thai Meteorological Department. p. 25. Retrieved 8 August 2016. ^ "ปริมาณการใช้น้ำของพืชอ้างอิงโดยวิธีของ Penman Monteith (Reference Crop Evapotranspiration by Penman Monteith)" (PDF) (in Thai). Office of Water Management and Hydrology, Royal Irrigation Department. p. 121. Retrieved 8 August 2016. ^ Yegar, Moshe (2002). Between Integration and Secession; The Muslim Communities of the Southern Philippines, Southern Thailand, and Western Burma/Myanmar (eBook). Lexington Books. ISBN 9780739103562. Retrieved 2013-02-20. 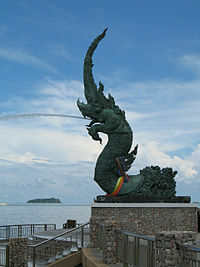 Wikimedia Commons has media related to Songkhla. This page was last edited on 31 January 2019, at 23:12 (UTC).